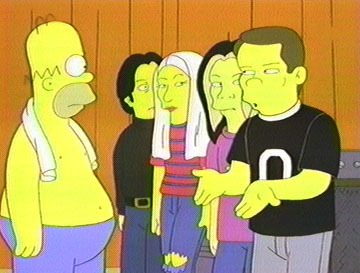 The Smashing Pumpkins caught The Curse of The Simpsons after performing with Homer at Hullaballuzah. Though he didn't appear in the episode, Smashing Pumpkin's keyboardist Jonathan Melvion caught the curse and then died of an “accidental” overdose of heroin. Watch out, Billy Corgan!